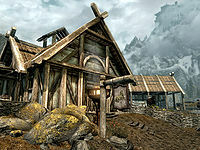 Whiterun Stables is a stable just outside the gates of Whiterun. Whiterun Stables is owned by Lillith Maiden-Loom and operated by Skulvar Sable-Hilt, who also lives here with his son Jervar. You can buy a horse from Skulvar for 1000 gold. The stables are to the right of the residence and consist of four stalls, two of which have gates on the front and always contain at least one horse. There are many food barrels in and around the stable and residence and a couple of red mountain flowers along the fence line. It is possible for both Skulvar Sable-Hilt and his son Jervar to die (see bugs). A carriage waits nearby driven by Bjorlam, while beside this, once you have completed The Blessings of Nature quest you will find Ardwen and her dog. The entrance to the stable residence is normally kept locked with a novice level lock, which can be opened by a key carried Skulvar Sable-Hilt, Lillith Maiden-Loom and Jervar. Entering leads into a large room with a fire pit opposite and a cooking spit to the right. There are two doorways off of this room, one to the right of the fire pit in the northern corner and the other in the western corner of the room. On your right when entering is a round wooden table and two chairs. On the table is a bottle of wine and a long taffy treat. To the left is a cupboard with a bowl containing a cabbage, a couple of pieces of cheese on the shelves and a bottle of wine and a food sack on top. Against the southwest wall is a long wooden table and bench with a portion of grilled leeks, a bottle of Nord mead, a bottle of wine, a cabbage, a bowl containing green apples and a plate of bread and cheese on top of the table. Hanging from the rafter above are four garlic braids and three whole salmon. To the right of the table is the first doorway into a bedroom containing an owned bed in the southern corner with an end table to the left and a drum on the floor at the foot of the bed. On the end table is the business ledger, while in front, on the floor are a pair of fine boots. Against the northwest wall is a dresser containing clothes with a bottle of wine, a small coin purse and a sweet roll on top. To the right of the fire pit is a pair of wall shelves holding mainly clutter, but with a haunch of raw venison on a plate. By these is the second doorway into another bedroom used by Lillith. There is a single bed in the western corner with an end table to the left and an unlocked chest at the foot of the bed. On the end table is a bowl containing four bottles of Nord mead and the chest contains only minor loot. Against the northwest wall is a small set of shelves with a display case on top containing a random dagger, beside this is a set of clothes and on the lower shelf is a level locked strongbox. Against the northeast wall is a long end table with a potion of minor healing, a bottle of Nord mead, an iron sword, a honey nut treat and a common book on top. A corundum ore vein is located north of the stables. Go to the main gate, look left, go up the stairs and follow the wall. There is a common occurrence of a bug here, when Louis Letrush becomes duplicated multiple times and/or becomes embedded in the ground just outside Whiterun after finishing his quest. His duplicates can be dealt with using the console: click on the Letrush duplicate and type kill followed by disable. If either Skulvar Sable-Hilt or Jervar die, their bodies will never disappear. ?